Not sure that your ultrasonic is working properly? The foil test is one test that can tell you if it is. The foil test is commonly used in medical, vet and dental practices, before the start of each day. It is critical that surgical instruments are properly cleaned, then sterilised. A properly functioning ultrasonic cleaner is the key to an effective cleaning process. Fill the tank with the recommended amount of water and add a squirt of dishwashing detergent. Detergent will help to soften the water. Degas the water in the tank. Set heater thermostat to 60C. After temperature is achieved run unit on cleaning cycle for about 10 minutes. Degassing will expel the air so that the unit operates at optimum level. NB If your machine does not have a heater you can boil water in a kettle to get the same result. In a boil proof jug add two parts boiling water to one part tap water. If the tap water is room temperature (25C), the combined water will give you about 60C. Adjust the mix for your local conditions. You will need a piece of kitchen aluminium foil large enough to cross the tank diagonally and to drop towards (but not quite to) the bottom of the tank, with some excess foil above the water, that you can hold onto. The foil should be oriented vertically (ie hanging downwards) – if it is laid horizontal the test will be invalid. NB Do not allow body parts to touch or be immersed in the tank water at any time during cleaning operation. Run ultrasonic cleaner through a 10 minute cycle, while holding the foil above the water line, with the foil descending to just above the bottom of the tank, and hanging diagonally across the tank. 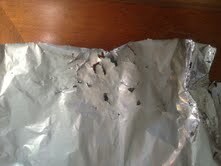 Remove and inspect foil. A functioning ultrasonic cleaner will show evidence of the cavitation effect on the foil. The more powerful the machine the more intense the reaction. This may range from pin sized indentations in a light weight machine of say 30W, to foil being ripped to shreds in a larger unit (say 100W+). Lack of indentations is a sure sign that machine is not working properly. If you performed this test after delivery from the supplier you should advise the supplier and request return/replacement instructions. Warning: Some cheaper machines are named in a way that will deliberately mislead the buyer. Unless the machine clearly states that it is an ultrasonic cleaner customers should assume that it is not. Ultrasonic cleaning pretenders will never pass the foil test. Contact the supplier or your local Department of Fair Trading for further advice. NB If you are in a medical/dental practice consult your practice manager or your practice procedure manual. Medical practices in Australia should refer to AGPAL if they need specific guidance. OK. You’ve bought your new ultrasonic cleaner and you want to know how to set it up. There’s a trick to doing most things – and this is no exception. A little time spent following a procedure could save you a lot of money! Inspect the box for damage before opening it. If outside shows any sign of rough treatment during transport, take photos – they might be needed to show the supplier or freight company for a claim. Take more photos of the unit and anything inside the box if they have been damaged in transit. Take a clear image of the unit’s serial number. Inspect contents. Take particular note of the tax invoice and the unit’s user manual/operations guide. Often the items supplied will be specified in the user manual. Check you have them all. If not, contact the supplier ASAP and ask for anything that seems to be missing. Tax Invoice A valid tax invoice will show GST included in the sale, the supplier’s Australian Business Number (ABN) and address in Australia. The tax invoice is a valuable document which should be kept safe and produced (or copied) if you ever have any warranty issues. Some sellers on Ebay will provide a tax invoice which is generated through their system. As long as the document meets the requirements set out in the New Tax System (GST legislation) it doesn’t matter what it looks like. This contrasts with invoices/shipping documents that make no mention of the words tax invoice, GST included in the purchase and the supplier’s ABN. We recommend caution if dealing with a supplier who ships cleaners without a valid tax invoice, because it is extremely unlikely that you are dealing with a registered Australian business who can be forced to adhere to Australian consumer protection laws. Once you know you have everything that’s supposed to be included, you can move on further. The next step is about checking your unit is safe for you and your staff. Check the power lead provided with the unit has an approved Australian/New Zealand style plug – sometimes suppliers will provide one that fits in the socket, but it does not have the insulation on the top pins (normally black). Plugs without visible insulation on the top two pins are the ‘old style’ which ceased being approved for sale in the late 1990s. Check for C Tick label. Electrical equipment needs a C Tick label to identify the authorised supplier and to show that the supplier can prove the device meets Australian/NZ EMC requirements. By law ALL ultrasonic cleaners sold in Australia and New Zealand must have this label, whether imported or manufactured locally. They also require the supplier’s electrical code (usually a number starting with letter N or V, representing the state the company is registered in). NB If the unit does not have a C Tick and the supplier’s electrical code, then it is illegal for sale in Australia and New Zealand and it may also be unsafe. Contact your local Department of Fair Trading and request a refund from the supplier. Check power supply. Most quality units will be manufactured for 240Volt mains supply. Many units will state 220 or 230 Volts, or some range between these. The closer to 240 Volts the better. If the unit is labelled less than 220 Volts its working life can be much less than one made for 240. NB Do NOT attempt to use a device made for US power supply (110 Volts). Return it f or replacement or refund. Use a surge protector. Even robust commercial ultrasonic cleaners can fail due to power surges. Like computers, these days, ultrasonic cleaners all have electronic components which can easily burn out when power spikes occur. We recommend taking sensible precautions, like using a quality surge protector at all times and to remove the device from the power outlet during electrical storms, or when you are absent from the workplace.. Most suppliers will provide a user or operating manual. Manuals from quality suppliers units will be in plain English that the average person can understand. Often the manual will also specify the unit’s warranty and support arrangements. We recommend against items that must be sent overseas for warranty service. The following points are obvious, but we’ve all seen the line – if all else fails read the manual. BEFORE you connect the unit to the power supply, or attempting to use it ensure that you read the manual and understand it. Follow the instructions in the manual. If you don’t, often the manufacturer’s warranty will not apply. It could be an expensive mistake. After you have set up your machine as per supplier’s user manual, you should immediately test its function. Run a simple foil test to satisfy yourself you have a true ultrasonic cleaner, not a dud. If the machine fails the test contact the supplier and have it replaced/get a credit. EMC is Electro Magnetic Compatibility. When a product shows the C Tick symbol it tells the consumer that the supplier has proven that the device meets the Australian/New Zealand regulations for EMC. A product that does not meet EMC rules may interfere with radio and other communications, including devices such as pace makers and other sensitive life saving equipment. The supplier’s code (usually a number starting with letter N or V) on an electrical product tells the consumer that the supplier has tested the device for compliance with the Australian/New Zealand regulations for electrical safety. The CE label often seen on electrical products has not value in Australian/NZ. It is easily confused with an almost identical CE label which represents Chinese Export. By liquidglassoz  Posted in automotive/mechanical, dentists/vets, jewellery, SCUBA/marine, Setup, shooters, tatooists, ultrasonic care / maintenance, Uncategorized	 Tagged australian supplier ultrasonic cleaner, buy ultrasonic cleaner australia, care and maintenance of ultrasonic cleaners, cleaners ultrasonic australia, how to buy safe ultrasonic cleaner, how to set up ultrasonic cleaner, just got my ultrasonic cleaner, safe ultrasonics, safe ultrasonics in Australia, saft ultrasonics, saving money with ultrasonics, setting up my ultrasonic cleaner, surge protector, ultrasonic C Tick, ultrasonic care, ultrasonic cleaner australia for sale, ultrasonic cleaners need what labels, ultrasonic cleaning sale aust, ultrasonic compliance, ultrasonic devices australia legislation, ultrasonic inspection, ultrasonic jewellery cleaner australia, ultrasonic safety, using a ultrasonic cleaner, using an ultrasonic cleaner, using your new ultrasonic cleaner, what labels are required on ultrasonic cleaners, who would sell ultrasonic cleaners?